"I have been making this recipe for almost 20 years. It was the recipe my mom always made for us. Now my kids love it, too! 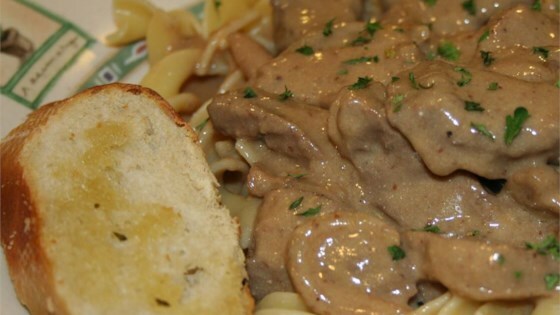 It's always a hit, even with friends and family who do not normally care for Stroganoff. Goes great with rolls. Also, I have tried using reduced-fat and fat-free sour cream. Turns out okay with reduced fat but I did not like it with the fat-free sour cream." Crumble ground beef into a large skillet over medium heat; sprinkle with seasoned salt. Cook and stir until completely browned, 7 to 10 minutes. Drain excess grease from skillet and return to heat. Stir onion, nutmeg, and cloves into the beef. Whisk hot water and flour together in a bowl until smooth; pour over beef mixture and mix. Stir mushroom soup into the beef mixture. Place a cover on the skillet. Reduce heat to medium-low. Stirring occasionally, cook at a simmer until thickened, about 30 minutes. Whisk sour cream, parsley, and dry mustard together in a bowl. Stir sour cream mixture into the beef mixture; season with salt and black pepper. Continue cooking at a simmer uncovered until hot, 15 to 20 minutes. Bring a large pot of lightly salted water to a boil. Cook egg noodles in the boiling water until cooked through but firm to the bite, about 5 minutes; drain. Transfer noodles to a large bowl. Ladle beef mixture over the noodles and mix. The rich and delicious classic Russian dish. I loved this recipe, the flavor of the sauce was amazing, I used slice filet instead of ground beef and served it with a crusty garlic bread!